Dress up as a superhero, run, and help raise not only money but awareness for domestic abuse victims. Registrants can receive a discount of $2 when using Bridgeway Behavioral Health coupon code for the 5th Annual RUSH 5K: A Run Uniting SuperHeroes. The code is hero2 and will be available until the cutoff date for registering, April 29, 2015. 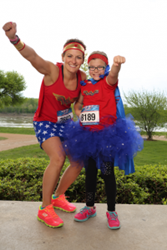 RUSH 5K: A Run Uniting SuperHeroes is a superhero-themed race that will be super fun for the entire family. Proceeds will benefit Bridgeway Behavioral Health and The Sparrow’s Nest Maternity Home to help women and children in the area that are facing difficult situations. The race will take place, rain or shine, on May 2nd at 9:00 a.m. in Frontier Park, 650 S. Riverside Dr, St. Charles, MO 63303. The first 350 registrants will receive a t-shirt and sizes are guaranteed if registered by April 1, 2015. All participants will receive a goody bag and post-race snack with their registration fee. Everyone is encouraged to wear family friendly superhero costumes. Anyone who participates in fun run will receive a participation ribbon. Fleet Feet will professionally time runner and walkers in the 5K and determine who will be awarded for the Overall and Top 3 Finishers for each age group (14 and under, 15-19, 20s, 30s, 40s, 50s, and 60+). The kid’s (12 and under) 1 mile run will take place after the 5k at 10:00 a.m. After the races there will be a party with bounce house (weather permitting), DJ with family friendly music, face painting, and plenty of other activities for the entire family. Registration is online, https://rush5k.itsyourrace.com/register/, until April 29th. Entry fees until March 1st is $20 per 5K participant, March 2nd - April 1st $25, after April 1st $30. The entry fees for the 1 Mile participant until March 1st is $10, March 2-April 1$12, and after April 1st $15. Registration and packet pickup will start May 1, 2015, 10:00 a.m. to 8:00 p.m. at Fleet Feet St. Charles, 3813 Mexico Rd., St. Charles, MO 63303. Bridgeway Behavioral Health is a private, not-for-profit organization that has been serving the St. Louis metropolitan region since 1978. Providing services to people in need dealing with addiction, domestic violence, and sexual assault in 13 locations across the Eastern Missouri region in urban, suburban, and rural locations. Bridgeway Behavioral Health’s mission guarantees that every client they serve will leave their programs with the tools needed to make better choices and increase the client’s opportunity for a happier, healthier, and more productive life. Visit them online to read great informational blogs or to seek help for a loved one at http://www.bridgewaybh.com/.